I’ve been having an email conversation with my son, Terrill, lately. I have lots of these but this one has taken an interesting turn. He has issues of trust. He has not trusted us. He is currently finishing up his longest prison sentence yet so he has a lot of biding time to do. He is also open to finally work on his trust issues. While he sits in prison which is a world where trust is a rare commodity. Self-protection is the survival game. But Terrill has been missing having real conversations with people. Isn’t that a true need? So I’ve challenged him to walk into some vulnerability (in prison!) and trust some people. I needed to hear that confirmation! There’s a young guy I work out with who I was just talking to about getting burned and craving a normal conversation. He was a little upset from my venting in the presence of some questionable ears in the area, but I didn’t care and he’s still kicking it with me. He goes to church, by the way. Oh! Last night I gave him one of the pictures I drew. It was the main one I want you to get, but he liked it and the gesture was the best way at the time to show him God’s love. I’m definitely letting the Holy Spirit lead me in my decision making while in here. I can see more than ever by the mentality here how flawed my thinking was and how mindful I need to stay in trusting God. It’s becoming normal for me doing so, and fist fighting with God is becoming a thing of the past. You mentioned trusting God. Big stuff. Especially for someone with trust issues (which is more people than you would think). So many people love God and do trust God but only go so far with it. They trust this God-in-a-box who is safe. They trust this God they create and believe it is enough. Truth is, it probably is enough to make it to heaven and have some blessings here on earth. But…our God is a big God. A wild God. A God who is beyond our words of description. A God who cannot be figured out so easily yet who is consistently FOR us. This does not compute in our minds when we want to control the outcome. When we want to trust something we completely understand first. Then there are the times when we dare to trust God and feel that God has let us down. So we don’t really trust again. Or we move back to that safe trust, doing just enough. But those with big faith, those with a big life, those who live like they get more, those who live like they were born on purpose, trust God. Through it all. This is an endearing faith. This is a real faith. Then there is this. Truly ponder the wow of this truth. 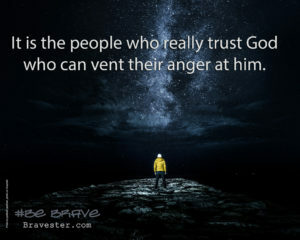 It is the people who really trust God who can vent their anger at him. This is a brave faith. You seem to be making steps to a braver faith in a self-protection-survival world. Welcome. I think I knew trusting God would be this tough to handle, which is why I waited so long to do so. I do believe it is all worth it though. Jesus really deserves it! It is my life now. Thank you and thank God for your years of faithfulness to God and to speaking into our lives! This is all so hopeful. Is it hopeful for you too? Because you are living in a self-protection world but you aren’t in literal prison? Be challenged. God is bigger and wilder than whom you may have been following. But he is consistently for you. And you are a mix of fear and faith, like me. We allow our fears to do the hard work of revealing the deep truths about yourself. We don’t cling to our fears or feed our fears but we mix them with our faith. We listen prayerfully to what they teach us and offer them up to God as an expression of our weakness and our need for him. Then suddenly we are slightly braver. Maybe even having real conversations with people? Update from Terrill, November 15: Allowing myself to be vulnerable by trusting God and staying open minded about there being likeminded individuals nearby has displayed some of God’s truths! It’s hard in a place such as this to find genuine believers because of the survival situations, but they are here. Romans 16 help reveal some secrets.